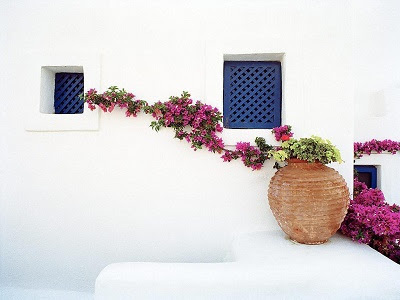 Bougainvillea is a genus of 18 species of shrubby, climbing deciduous plants native to South America. 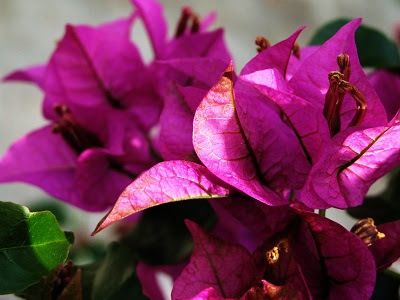 The true flowers are actually insignificant, however it is the brightly coloured, long-lasting bracts (modified or specialized leaf) which make bougainvillea such a popular garden and houseplant. While bougainvilleas are most commonly propagated from cuttings, there is no reason why you can't grow them from seeds - just so long as you can get hold of a viable seed pod. If you are collecting your own seeds then you will find that large, mature specimens are likely to be more fruitful. True species will generally grow true to the parents, while cultivated forms will not and are generally believed to be sterile. You will find the seeds in a pod, inside the bract. Each pod is in three sections, each one containing a plump, and usually brown seed. Gently remove the seed from the pod. Undersized or shrivelled seeds can be discarded. Fill 3 inch pots with an ericaceous, well-drained seed compost. Alternatively produce your own by mixing equal parts of fine-graded peat moss and perlite. Place one seed on the surface of the compost and press in to help secure it in place and to provide good contact with the compost. Top the compost with a thin layer of horticultural grit, vermiculite or perlite and then either water from the base or gently water from the top. Place the seeds in a heated propagator at a temperature of approximately 25 degrees Celsius. Alternatively seal the pots inside a clear polythene bag. Place the pots or propagator on a warm, bright windowsill, but once which does not receive direct sun during the warmest part of the day. Allow the soil to dry out between waterings, but avoid waterlogging. You can expect the seedlings to emerge between 2-3 weeks, however bougainvillea seeds are known for their irregular germination so don't give up on them until week 5. Once germinated, remove the pots from the propagator or bag but continue to grow them in their warm, bright position. Bougainvillea roots are notoriously fragile and so do not pot on until the root system has fully established in the pot. Once established they can be potted on into 2 litre pots containing a good quality ericaceous compost. Avoid disturbing the roots when potting on.